Facebook has an active user base of over 2 million with 300 PETABYTES of user data on its servers. Sounds huge and cool right? Straight out of a sci-fi movie if you looked at these facts some 50 years ago. But it's a reality now. As cool as it sounds, the data is pretty much of a challenge for advertisers. Not that they have to handle all of it, but utilizing your data for the most beneficial purposes is what makes you a digital ninja. Anybody can click that ‘boost post’ button and run ads (super expensive that way though). But what makes you standout is how you utilize data from your campaigns and Facebook Analytics is there to help you! Facebook Analytics provides you an ample amount of data only if you know how to track your website or app traffic. The next step is how you analyze that data to understand the traffic behavior to improve engagement and conversions. In this article, I am going to teach you how to use Facebook Analytics, the different types of reports, how to read data and use each report. Let’s begin without wasting time on less important things. 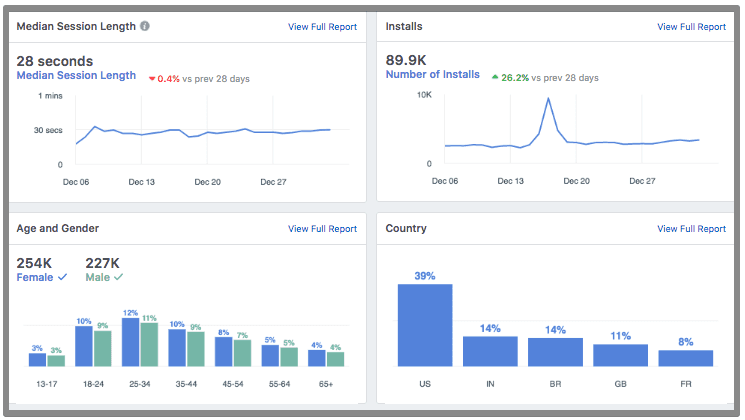 Just like air, Facebook Analytics is a FREE and vital. It helps you measure your website and mobile app traffic. It contains multiple types of reports which you can use to analyze your data in multiple ways. Here are some of the cool facts about Facebook Analytics. You can create funnels to monitor user journey through your website. There are two things that are responsible for driving data in Facebook analytics, app events, and user properties. App events define any user activity on your website or mobile app while user properties are assigned to users for segmentation purposes. If you are a marketer and want to drill down into your ads performance, this can be your ultimate guide. Before going further, make sure to add Facebook pixel on your website, because most of the analytics reports are based on pixel. To access Facebook analytics, you will have to open your business manager and from the top left drop-down, select analytics. Next, select your analytics entity. This is basically the data source, which is used for reporting. It can be your business page, facebook pixel, or a mobile app. After you select the entity, you will land on your analytics home page. The homepage displays an overview of your analytics data. On the top bar contains three different tools to customize your reports. The first drop-down allows you to switch to a different data source. Second is a date range selector and third is for creating a new or applying an existing segment. This bar is visible in all reports. The very first row contains the most important metrics related to your website. Unique users, new users, sessions and page views. The percentage value displayed in the above image shows the percent change of metrics compared to the previous time period. If you have selected the date range as last 7 days, it will compare this week's data to the previous week. If the metric value has decreased as compared to the previous period, the percent value will be displayed red with a minus(-) sign, otherwise, it will be green with a plus(+) sign. To view all the metrics and further drill down each metric, click on the view full report link on top right of this report. These metrics are basically drawn from events. When you click on the view full report link, you will see all the standard and custom events you have added to your website. I will further explain about this report below in the events section. The second row in the overview section displays an overview of the active users by last 24 hours and by hour of the day. As I said earlier that Facebook updates data very frequently, so the first graph in the above image displays active users by hour of the current day. It also displays the percent change in the active users compared to previous day. The second report is a heatmap of the active users by hour of the day. Using this report you can find which hour of the week your website receivers most active users. You can view the complete report by clicking on the view full report link. Until now, you will be able to know how to read the important reports on the overview page. Let’s move on to understand how we can break down each individual report. The second option in the left menu is dashboards. By default, there is no dashboard added in any of the analytics accounts. If you don’t know about dashboards, it is actually an easy to access shelf where you can keep your frequently used reports. It can also contain a custom created report or you can save a chart from any other report. To create a dashboard, click on the dashboard option and click on create dashboard button. Let’s create a dashboard containing a report for all my custom events. Enter the dashboard name as custom events and click get started. Click on the create chart button inside this dashboard. Next, enter the chart name and select the events you want to include. In my case, I am only selecting custom events. You can also apply existing segments to this report or even you can edit the segments. Below you will see the chart which you can easily customize and apply filters. On the top bar of the above image displays the controls. You can select the date range, switch between bar and line chart, change metric and change time interval. By selecting the bar chart, you can further drill down the report by city, browser, country, client type,..,etc. By selecting the line chart, you can also add a goal to view if the events are reaching your expected level. To do this, select the chart type as line, and click on the goal tab on the first section. Enter goal name, goal value and click apply goal button. Scroll down to see the chart. You will see how often do you reach the target and which day performs best and vice versa. Once you create your required chart, you can save this by clicking on the save & go to dashboard button on top right of the page. A single chart within a dashboard is known as widget and you can delete or edit any widget at any time. Activity analysis contains different types of reports which you can use to analyze the behavior of your audience. I will be explaining the important reports that you need to understand and the rest can be easily used if you know how to do it once. The active users report displays the trend line of user activity and sessions for the selected date range. It also displays the age and gender data related to active users. You can apply a segment to this report and also able to further break down each report by the given metrics. The revenue report displays data related to metrics like total revenue, total purchases, unique purchases,..etc. It also displays multiple charts where you can apply filters to further drill down the data. For example, you can see the revenue by age group, revenue by traffic source,..etc. Now I would say that funnels report is the super important for analyzing the traffic behavior. If you have a website, it’s necessary that you add event pixels to create a funnel. A funnel is basically a path users follow to complete a certain goal. For example, you have an ecommerce site and you have added the ecommerce events view content, add to cart, initiate checkout and purchase. You will expect the visitors to follow this path. View content -> add to cart -> initiate checkout -> purchase. When you create a funnel, you will be able to see on which step most of your website users drop off. To create a funnel, click on create funnel button inside the funnels report. Add the steps you want to see in the funnel. The steps would be events that you have added on your site. To view the funnel, click on the apply button. As you can see clearly, the percent of people dropping off in each step. This helps you better optimize your funnel pages to improve conversion rate. You can further drill down this funnel by adding event parameters. To do this, click on the select parameter drop-down button and let’s select browser. This gives you a ton of information because you can easily see the performance of each browser. If you see there is a huge drop-off in a step for a specific browser, you can focus on optimizing your page for that specific browser. Finally, click on the save button to save this funnel to monitor next time. Retention is something more related to mobile apps. It displays how you retain your customers after their first visit. For example, you have an android game app, you can see this in this report, how often users open your app. You can also add parameters to further drill down the report the way you did previously. Cohort displays data about a group of people who perform two events you choose during a given time period. This report comes handy in measuring and optimizing retention and lifetime value. By selecting two events, you can measure the time it takes for going from one event to the other. For example, you can select the events add to cart and purchase to see how different groups navigate from add to cart to purchase. To create a cohort, click on the create cohort button inside cohorts report. Select the two events and click apply button. Breakdown helps you break an event further by event parameters to analyze the data. For example, you can break down the add to cart event by traffic source, device type, or device OS. For any event, you can add up to three parameters to breakdown the report. To do this, click on create breakdown report, select event and then choose your parameters to breakdown. This section displays all the standard and custom events you are tracking on your site. You can click on each of the event to view performance and further break down using parameters. The important point you need to understand here is about the parameters you track with events. In the above code, content_name, content_type, content_id and currency are parameters that capture specific information about the event. Inside the events report, you can analyze the event further by using these event parameters. For example, you can see the number of people clicking on add to cart button with product name nike. To view data only by specific product name, uncheck all the other boxes from the right list. In the debugging section, you can debug your events on different devices. This helps you see if there are errors occuring in any type of device. To see the lifetime charts, it’s necessary that you add purchase event to your website, app or page. This chart helps you understand the value of your customers. You can read more about lifetime value here. This section displays the complete picture of where your audience location, job titles, relationship status, age, gender, and languages. This report displays data related to device type, OS version, device model,..etc. you can use this report to optimize your page for different types of devices. In the settings tab, you can select the time zone and permissions. You can also control other users to see purchase information. Session timeout interval in Facebook analytics is the amount of time passes without any event data being received before a new session starts. The session timeout interval for web events is 30 minutes. Until now, I believe you have a good understanding of Facebook analytics. The main advantage of using Facebook analytics is the detailed demographic data. If you have any questions related to this topic let me know in the comments section below or if you need help with implementing Facebook pixel get in touch with us.